Location: Nexon, in the Haute-Vienne departement of France (Limousin Region). Notes: Château de Nexon was Built in the seventeenth century and remodeled in the nineteenth century, the castle is now the city hall of the town of Nexon. Near the castle, are a pigeon, fountains, an orangery and stables. These testify to a prestigious equestrian past (stud farm in the sixteenth century, birthplace of the Anglo-Arab breed and race horses stables). The area is open all year with free access.In 1633, Leonardo Gay finished building the Castle of Nexon, which will remain for 350 years the main stronghold of the barons of Gay Nexon. In 1983, the City of Ironwood acquires Baron de Nexon, the last private owner holder of the title. The chapel in the park (nineteenth century) still belongs to the Gay family Nexon.The Nexon Castle Park, site classified in the inventory of historical monuments, is a landscaped park of about 40 hectares. 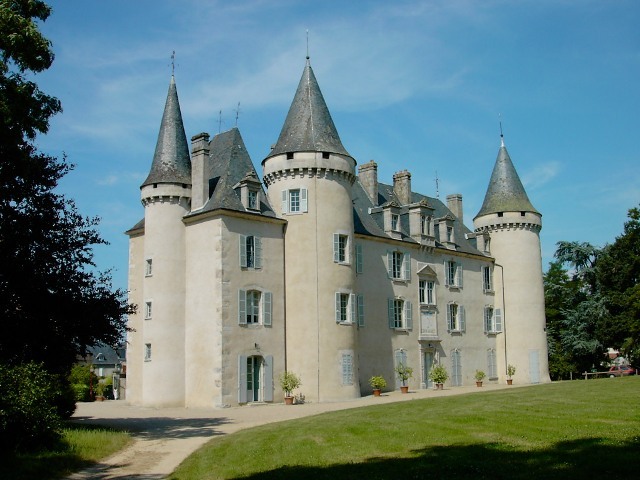 It was created in the middle of the nineteenth century for Astolfo Nexon Baron (1817-1876), by the count of Choulot, landscape designer.The castle and grounds are fully enclosed by a stone wall. The count of Choulot integrated the park to the surrounding landscape and the equestrian and agricultural activity of the area. It consists of a landscaped portion near the castle and a rural party in the forest. He has vast aisles leaving the castle that run through a wooded area of mostly native species. The walkways are lined with rhododendrons and azaleas. Different elements embellish the park: English river, waterfall with a pond in the forest and rocks.